On a sunny day at Beckenham, Kent held their nerve to win the T20 Cup in a contest that went right down to the final over of the third game. As the day began, only Warwickshire had their destiny in their own hands: a win in either of their games would have handed them the Cup after strong performances earlier in the competition. Both Kent and Middlesex, meanwhile, were reliant both on winning their games and on other results going their way. The first game of the day was thus crucial to both team’s hopes; and it was Kent who kept their title dream alive – while quashing Middlesex’s – with a comfortable 7-wicket victory. 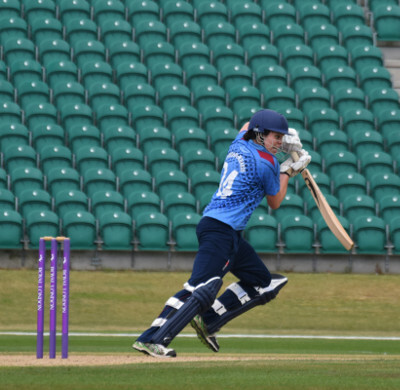 Middlesex, having been put in, started slowly and were soon undone by a bit of Suzie Bates magic, as she seized a wicket off her first ball – Tash Miles, caught by Tash Farrant at backward point – and followed it up with the wicket of Fran Wilson four balls later, lbw attempting a sweep shot. It put Middlesex on the back foot and they found it hard to recover, posting just 111, a total which Kent chased down with 9 balls to spare. Middlesex could thus hope for nothing more than the consolation prize of victory against Warwickshire, but this nonetheless seemed to be enough to spur them on. 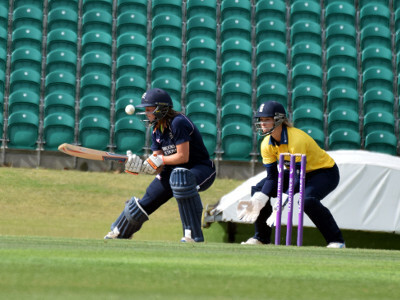 Warwickshire had posted a mammoth 137-8 in their 20 overs, thanks to the aggressive intent of openers Amy Jones (29 off 20 balls) and Georgia Hennessy (36 off 37). It looked an enormous ask, but Middlesex proved themselves equal to the task as England Present came together with England Past in the form of Fran Wilson and Beth Morgan. Coming together on 40-2, the two shared a 98-run partnership and fortune favoured the brave as they rode their luck in the form of dropped catches and missed run-outs by a nervous-looking Warwickshire side. 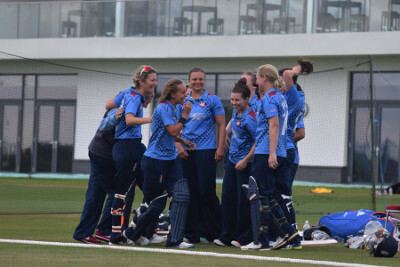 An improvised ramp shot for four over Wilson’s head in the final over helped seal the deal for her team, as they won by 8 wickets. Thus it all came down to the third and final game of the day between Kent and Warwickshire. Put in by Kent, Warwickshire were under enormous pressure after their poor showing against Middlesex, but openers Jones (40) and Hennessy (37) laid a solid foundation, taking their side to 55-0 at the halfway point. Once they were dismissed, in the 13th and 14th overs respectively, it was left to Marie Kelly and Jenny Gunn to frantically push for singles in the last 5 overs as the pair dragged Warwickshire to a competitive 126-4. It might have proved enough, but the old adage that catches win matches came home to roost and, while Warwickshire’s fielding was much improved from their first game of the day, dropping Bates twice in the course of the first four overs was a costly error. Bates went on to amass 43 before finally being caught by Becky Grundy at backward point in the 12th over. A glimmer of hope shone upon Warwickshire as Charlotte Edwards and Tammy Beaumont both followed Bates back to the dug-out, with Kent still requiring 39 off the last 5 overs, a figure that became 30 off the last 3 and 7 off the very last over of the day – still more than a run a ball. But a Greenway straight drive for four ensured that Kent brought home the silverware, winning by 7 wickets with two balls to spare. While Kent’s England players are often shouted about, today the calm composure of Alice Davidson-Richards (30* and 19*) deserves special mention: coming to the crease in difficult circumstances both times, she was ultimately crucial to the two wins that her team needed to secure the Cup. The Bears, meanwhile, were left cruelly ruing what might have been.